Afroceilidh English Moves THE FULL BIZ! And more! Global Grooves! And now for something completely different! Your guests will never forget a night like this! AfroCeilidh is a Great Night Out! Come on your own, or with a group of friends, and you'll soon get involved in this unique, multicultural approach to English barn dance. The band brings together a stunning array of exceptional talents who keep tradition relevant, intercultural and most definitely 'made in England'. Launched in 1999, the band has gone on to score successes in national touring and international festivals, and have recorded 2 albums, both of which went straight into Roots' 'Top 10 Playlist'. 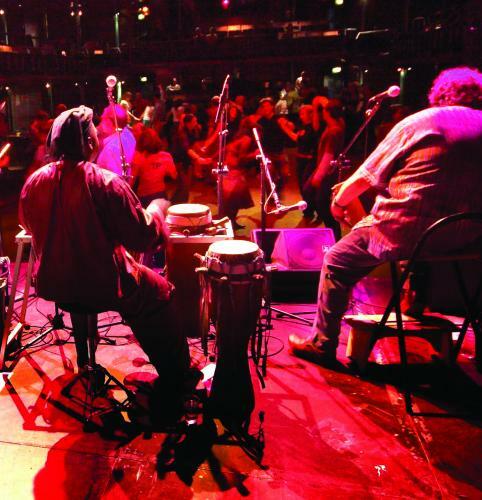 The African beats are guaranteed to set even the most churlish foot a-tapping. They kick in as soon as caller/melodeon Roger starts helping you find your way through the easy English figures. English tunes are laid on driving grooves to make you strut those figures in a way they don't usually get strutted! A new direction for the established ceilidh fan and a great introduction for those who want to try it! The fuller 5 piece band physically shakes with energy. And then there's even more! All the dancers feel the vibes - beginners or experienced dancers cannot help but respond to the energy and drive of the music - natural rhythms which force you to move naturally! Simply - an unforgettable night! 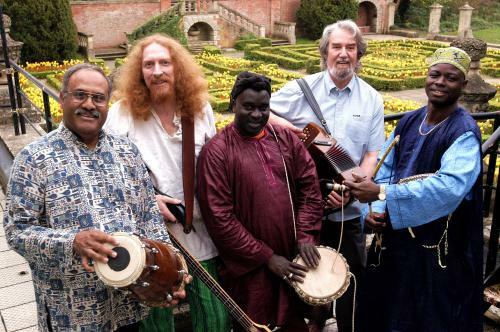 This Afro Ceilidh fusion band will perform throughout the UK, London, Birmingham, Leeds, Manchester, Liverpool, Bristol, Norwich, Nottingham, Cardiff, Southampton, Plymouth, Sheffield, Newcastle-upon-Tyne, Carlisle, Middlesbrough, Edinburgh, Glasgow.